thoughts that demand my attention. I am powerless over my emotions and I let the outward circumstances of the past, present and future affect how I feel. And, I am powerless over my body, the cravings, injuries, disease and other funny tricks that it uses to capture my attention. When I finally stayed sober, I was doing the outward actions of the Steps and the program, but something was missing, something – a connectedness, a feeling of belonging. I felt an inner pull toward something within myself. After a time, I realized that I needed to re-connect to a practice of meditation that I had sporadically pursued and read about over the years. I began an inner journey of learning about meditation, while, at the same time, I became active in my program, attended meetings, worked the steps with my sponsor, and found ways to be of service to others. The beginning meditation techniques helped me to relax, slow down, quiet the thoughts, sooth the emotions…surrender and to detach from our old ways of living and our old self. An 11th Step Meditation practice walks us through learning how to see ourselves in a spiritual light and how to overcome our past ways of living to “walk in the Sunlight of the Spirit.” I believe that an 11th Step Meditation practice will enhance our path of recovery. The best way to begin this process is to learn to recognize that we are “spiritual beings having a human experience.” We discover our “Higher Power” and learn to have a relationship with this Power. Many of the religions in the world agree that there is some type of Higher Power and that we are all an integral part of that Higher Power. But, most of us believe our image and concept of ourselves are separate and alone from the world. We feel alone. This is self-centeredness, what we call Ego, or as I like to call it, the FalseSelf. We have forgotten our connectedness to all things. To me, this is the root of our spiritual disease! The gift of the 12 Steps, as presented in Alcoholic Anonymous, is that all of the truths of these religions have been simply spelled out as actions to follow, to act spiritually, and to create a connection with our Higher Power and the our world around us. Webster’s dictionary defines the term ‘to meditate’ as ‘to engage in contemplation or reflection.’ But, to just drift aimlessly thinking about “things” is more like daydreaming. To Engage – implies that we are focused and doing this for a specific purpose. We need to add the word “concentration” to our definition. Concentration…..prolonged concentration. This is meditation. Try it now for a few moments…..try to quiet your mind and to think no thoughts…….How did you do? It takes practice and effort to learn this new skill! Meditation is prolonged concentration while engaging in mental activity either focusing on specific thoughts or focusing on nothing at all. But, in our world and in our recovery, we can see how busy our minds are, how powerful our emotions are and how much our bodies cry out for our attention. To begin our journey towards meditation we need to learn and to practice overcoming our thoughts, our emotions and our physical bodies. For me, meditation is spending quality time within the presence of my higher power. The practice of meditation helps me to develop the conscious contact with God through out my day just as it states in Step 11. It helps to imagine that we have several different bodies that combine to make-up the person that we imagine we are – our physical bodies, emotional bodies, and mental bodies. Often they seem to be operating independently and in conflict with each other – this is the inner unmanageability that is then reflected throughout the other aspects our lives. Meditation naturally brings together and centers the interaction of these different bodies with our spiritual body. Physically, meditation affects us in many wonderful ways. It increases the production and flow of endorphins, that naturally calm and soothe our body. It lowers our blood pressure, helps to re-align our brain patterns and thought processes, and allows our body to begin healing itself. Emotionally, meditation helps to reduce the intensity and frequency of our resentments and fear, moving toward a more consistent feeling of caring, compassion and love. Mentally, meditation allows us to detach from our addiction to thinking, our re-living of past events and projecting our worries and fears into the future. While this may be an advanced step, we can actively learn and begin to practice this prayer and meditation in all of the steps along the way, even from the very beginning. We will also be learning to discover, for ourselves, what our Higher Power is to us, and to begin to develop an inner relationship with this Higher Power. Meditation helps us through this process by learning and practicing meditation early in sobriety…or later, depending on where you are at this moment. At the time of our bottom we feel very isolated, alone and in much pain. We feel separate from the rest of the world and our Higher Power. This is the spiritual disease that we suffer. Although we have tried to blame other people, places and things for our situation, we are slowly learning that we helped create our world and our own bottom. Not only are our lives unmanageable but our thoughts and our emotions have become unmanageable as well. Thoughts are things. Science and spiritual teachers alike have discovered that our thoughts, feelings and actions all create energy and interact and influence our world around us. Our entire universe is one huge energy system. Atoms, when reduced to the smallest level, are simply energy. Our brain transmits our thoughts as energy. Our emotions interact with our environment as energy colored to reflect the type of emotion that we are creating. Our physical actions combine the energy of our thoughts and emotions that motivate action, such as our bodies’ movement, which is also energy. One perspective of our world and lives is to visualize everything as a multitude of dynamically interacting dancing energies. Meditation will help us to practice re-directing our energy in a positive way. So, as we think negative thoughts, feel anger, resentments and fear, and act selfishly and destructively, we are creating that same type of environment and world around us. Imagine the character of Pig Pen in the Peanuts. Like him, we walk around surrounded by a cloud of energy, swirling around us with a multitude of emotional colors and mental baggage, interacting with the world leaving our energy scattered about everywhere we go. As alcoholics and drug addicts, and human beings in general, we have mis-directed our energies. Meditation is a wonderful tool to help us re-train our mind and our perspective on our emotions and our lives, to re-direct our energies in a positive way, to improve the quality of our effect upon others and ourselves and to help create a more serene, centered, God-inspired energy cloud about us. When we live without giving ourselves time to regularly connect with our spiritual side, we are making a choice to get caught up in anxiety, fear, past, future and limitation, I call this our FalseSelf. A regular practice of prayer and meditation is a choice to focus on our positive, caring, loving, unlimited, spiritual nature, which I like to call, our SpiritSelf…in conscious contact with God. The first step to begin learning how to meditate is learning how to relax our bodies, how to not listen to the “voices” of our mind and to practice connecting with our Higher Power and other human beings. We are addicted to thinking. I believe that I am my thoughts and that they control me. I constantly give myself to them. The relinquishment of this addiction begins with awareness of it. Meditation is just like taking a spiritual vitamin or spiritual workout for the day! There is one secret to practicing living a spiritual life and that is: Just do it! We need to start somewhere. Do not just think about doing it. Learn to be patient, persistent and consistent. Any activity that will help bring new habits towards sanity and emotional balance into an unmanageable life is worth devoting your time and energy towards. 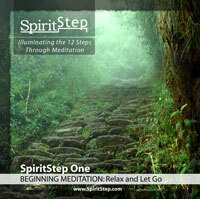 Welcome to the 11th Step Meditation Journey!